Hey, hey! It’s share my kitchen day! My winter kitchen that is. Which, to be honest isn’t that much different than my kitchen any other time of year. 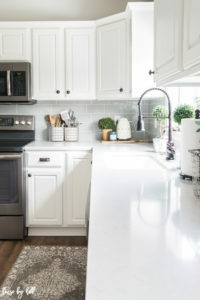 I really don’t change up my kitchen that frequently, but I took some photos the other day while I was shooting the house, so why not share it in all of it’s gray and white kitchen glory"
We did a complete kitchen makeover a few years ago, and I really tried to make design choices that I would like for a looong time. Because kitchen remodels are expensive, and I doubt we’ll ever do a complete makeover again. I tried to stay really neutral and make safe choices on the finishes. I really think I did a good job. That’s me tooting my own horn, by the way. No, but really, I still like my kitchen a lot…so I must have done something right.